Fairytales for Wilde Girls by Allyse Near has one of the best opening lines that I have read in a long time. It is a first line that will make the decision process between buying and browsing extremely easy. For that reason, I am not going to share it here. You need to experience this magic for yourself. 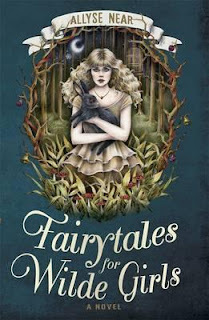 A cotton candy gothic fairytale set in the modern world, Fairy Tales for Wilde Girls is the story of sixteen year old Isola Wilde, and what happens when she finds a dead girl living in the woods behind her house. Isola has a lot going on in her life; new love interest, a best friend who won't talk to her anymore because she doesn't have romantic feelings for him, parents who are capital W weird. Plus, she can see things everyone else believes are mythical. Protected by six Brother-Princes, Isola must solve the mystery of the dead girl before it's too late. A word on the structure of this novel; this is an ambitious book form wise. It is not divided into traditional chapters but instead contains Interludes, play-script-like sequences and illustrations. What this does is defamiliarise the reader so that they truly feel immersed in the strange ways of the story. The interludes contain exerpts from an invented Fairytale Maven, linking reality to fiction thematically, and sign posting the emotional journey of the book. At times I found this book TOO fantastical. The plot was almost silly. Yet I can see that there IS a place for a book like this in the market and I know many people who would have loved these parts. I also couldn't put the book down. Near's pacing and tension were perfect. Each time I would say to myself, one more chapter and then I'm done, something would happen and I would be off again. I only wish there hadn't been illustrations in the book- sure they were beautiful but I prefer to imagine characters for myself.